Venice, Italy is well known around the world. Well known, often imitated, and often compared to places with similar traits. have been called the "Venice of the ____" (fill in the blank). Amsterdam - the "Venice of the North." others developed on their own and then someone noticed the similarity. 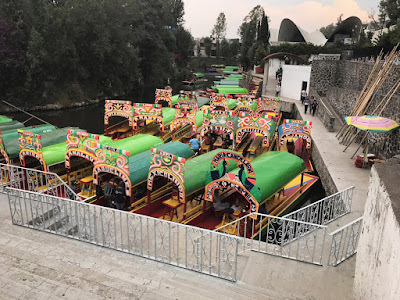 Such is the case with Xochimilco - a place just south-east of Mexico City. I've posted about this remarkable location before, and there are plenty of other sources you can find online to read about the waterway and the history behind it. Today I want to share photos and video of the place. My friend Ruben Jay is there right now, enjoying Cinco de Mayo (lucky guy), and he took a ride a couple days ago and sent these great photos and video clips for us to gaze at. 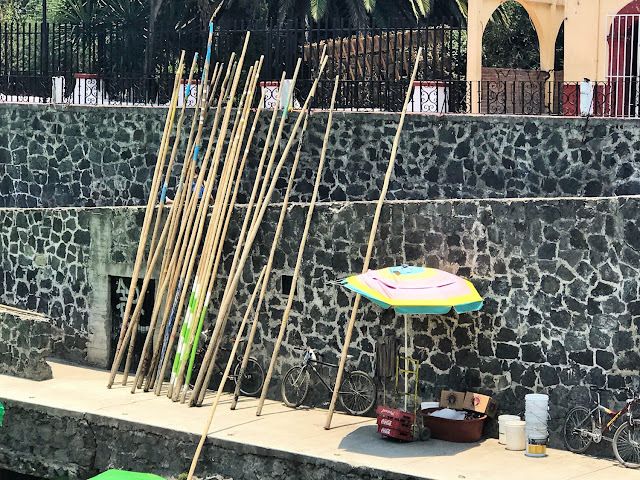 grab a taco, and check out the "Venice of Mexico". The boats in Xochimilco are wide, flat, and designed to host about twenty passengers. Most have a central table with chairs on both port and starboard side. Since first impressions matter when trying to get people to climb aboard your boat instead of the next guy's boat, the fronts of these boats are boldly decorated. 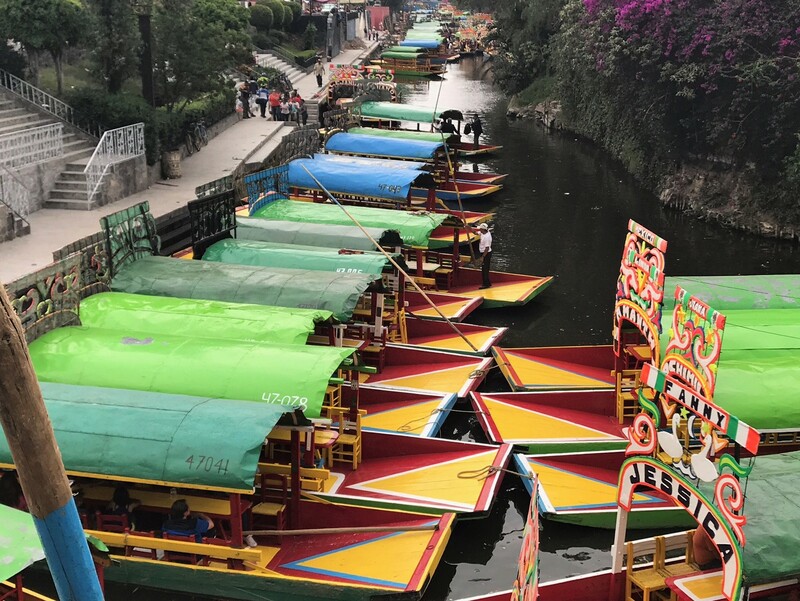 Ruben and his relatives stepped aboard the "Lupita", with a bold arching name on the front, and every single inch of surface painted in bright colors. The boats are known as "chalupas" as well as "trajineras". I could try to outline the subtle differences between the two names, but the truth is that I'm a pathetic gringo, and I have no flippin' clue if there even are differences. They are boats - this much I know for certain. 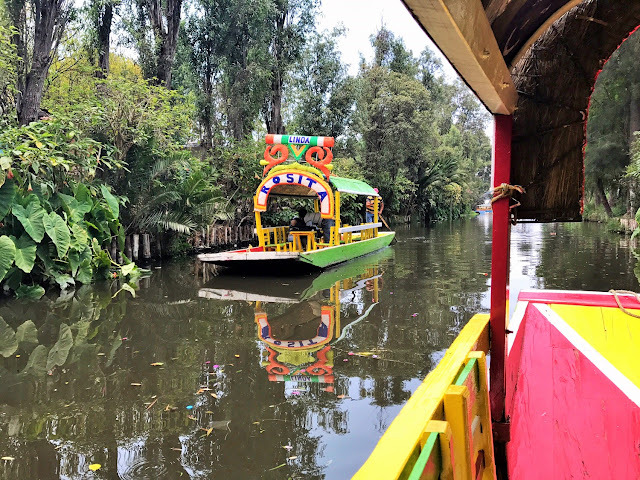 The passenger vessels of Xochimilco are often referred to by outsiders as gondolas, and it's not surprising. After all, they not only carry passengers, but they are also propelled by guys with poles. Yes, we know here at the Gondola Blog that Venetian gondolas are actually not pushed around with poles, but those who are less versed in gondolas often believe that to be the case. 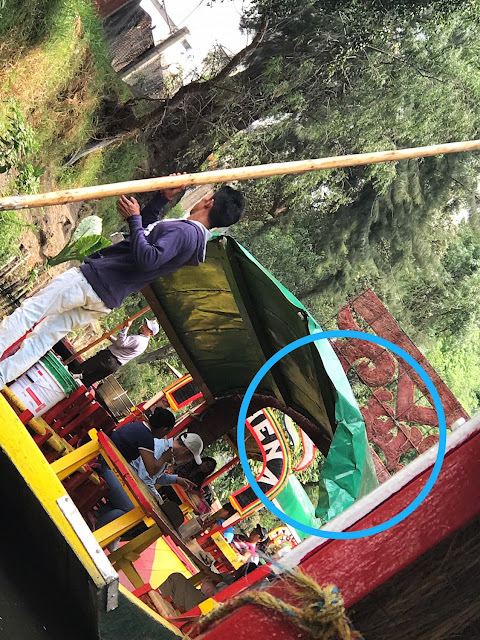 So when they see a guy outside Mexico City, pushing an ornately decorated passenger boat...with a pole, they shout "gondola!" It's not rowing, but it is work. After all, look at the size of those boats, imagine how much they weigh. They're made of wood, and apparently they bump into each other often - I'd guess they're built heavy. So pushing something like that along is no small task. I'd be really curious to see a few English punters go there and give it a go. Each chalupa has a lightweight aluminum roof. often involves bumping the corner of the roof in the back with his pole. There are a heck of a lot of chalupas on the water there. Here's a short video clip of the view as the "Lupita" was gliding along. Notice how all the chairs are stacked in some of the boats. Heading out onto the water, the "Lupita" encountered dozens of other vessels like her, with passengers out enjoying the floating festivities. that will come alongside and sell you everything from food to souvenirs. Ruben chose roasted corn on the cob. but they were available too. The "Lupita" passed by a very strange island known as "Isla de las Muñecas" - the Island of the Dolls - which has a sad origin and a sometimes creepy look. And then there are the musicians. Lots of boats go by with different musical offerings. Ruben tells me that rides come in increments of two or four hours and break down to roughly $20 US dollars per hour. and you pay for what you drink. Oh, and it's a heck of a lot of fun. Punting poles - looks like they stripe some of them. Big thanks to Ruben Jay for the photos, video, and information.